The Safco Steel Flat File Model 4998 features five drawers in a modular stack-able cabinet used for blueprint storage, maps and more. They are high-quality steel construction with extra-strength drawer rails and heavy steel side-roller assemblies with ball-bearing rollers for smooth, quiet operation of drawers. A positive closure keeps drawers tightly shut while courtesy bumpers keep them in place when in an open position. Rear hood and hinged front depressor protect drawer contents. The steel flat files feature museum and archival quality exterior paint with a durable powder coat finish. Each drawer includes chrome handles and label holders. Cabinets will stack up to 5 high, with no bolts required. Available in four different colors of durable paint. 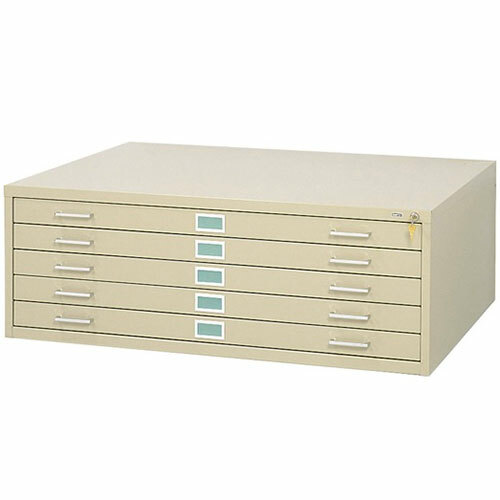 Outside Cabinet: 53-3/8" x 41-3/8" x 16-1/2"
Inside Drawer: 50" x 38" x 2-1/8"
EngineerSupply recommends Safco as its leading and more durable steel flat file cabinets for professional and daily use when storing blueprints, maps, art, x-ray storage, and almost any large flat document.